● Fitted for Oral-B Kids Electronic toothbrushes. ● Clean teeth and message gums gently. ● Effectively remove plague without irritating gums. 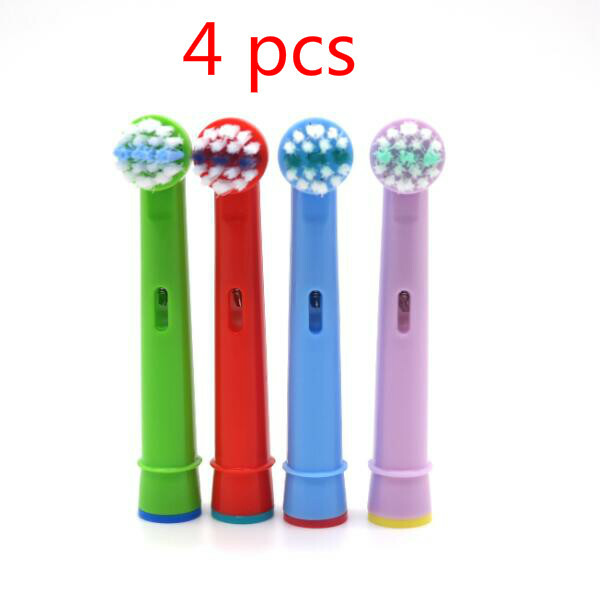 ● Soft bristle, extending into the depths of teeth, effectively remove bacteria. ● High-speed rotating and slight vibration which can promote oral blood circulation and massage the gums organizations. ● Durable to use and easy to replace. ● 4pcs in per set. Our toothbrush heads are NOT original Oral B products, and NOT compatible with Oral B Vitality Sonic | Oral B Cross Action Power | Oral B Sonic Complete | Oral B Pulsonic . Best Ways to use an Electric Toothbrush:	1.Only slight pressure is sufficient, let the electric toothbrush do all the brushing work	2.Use the electric toothbrush at least twice a day for two minutes	3.After applying toothpaste, don’t switch on until the bristle heads are against teeth. This will stop toothpaste from spraying off. 4.Divide your mouth into four quadrants/sections and brush one by one	5.Brush the outside surfaces horizontally along the gum line, slowly moving the brush heads along each tooth. 6.Brush the inner surfaces and be sure to hold the brush on each tooth for a few seconds at a time. 7.Tartar often forms more on the lower incisors. Give these teeth a little longer brushing time. 8.Brush over the chewing surfaces twice and ensure to brush the backs of you last molars	DENTISTS RECOMMEND YOU REPLACE THE HEAD EVERY THREE MONTHS	Feedback :	1) Your Feedback is really important to us, please leave the great feedback if you are satisfied with our product or service, thank you so much! 3) Please contact us before leaving neutral(3 stars) or negative(1-2 stars) feedback. We will try our best to solve the problem and leave you a happy shopping mood here. 4) Air Mail Post’s cost is the cheapest, but the delivery time is depends on the Post office. Please never leave negative feedback to us because of the late arrive date. It is really out of our control. Thank you! Payment Terms:	1. We prefer Escrow . 2. Because of the photo reason, the images are for reference only. Please take the item you get as the standard. 3. Please check with your country’s customs office to determine what the additional cost will be prior to buying. 4. Please indicate your personal requirement, such as colors, packages, value of declaration etc. If you do not specify the color, we will do randomly shipment. 5. As a buyer, it is your duty to pay the tax when you make a order from abroad. Our price does not include taxes, VAT, or other hidden charges. These charges are the buyer responsibility.